Y’all know we are no strangers when it comes to Harry Styles, but how we wished we were. Why, you ask? There’s a certain feeling that comes with listening to a band or an artist for the first time and blindly falling in love with their music. We’ve all felt it. Jumping into an album feet first with not a single expectation at all, only to be swept away by the feeling of complete wonder. Once that feeling is had, it cannot be had again, as even just one listen will rob you of that feeling. It’s very much in the same vein of having that one movie you wish you could wipe completely from your memory so you can have the feeling of unraveling its mysteries for the first time all over again. Knowing of an artist beforehand can often create expectations-- both good and bad-- that can taint the experience all together. Now, I’m sure many of you think this is review can only be headed in one direction. (Pun intended.) Please don’t get it twisted, this is a good review. In fact, it’s a great review. 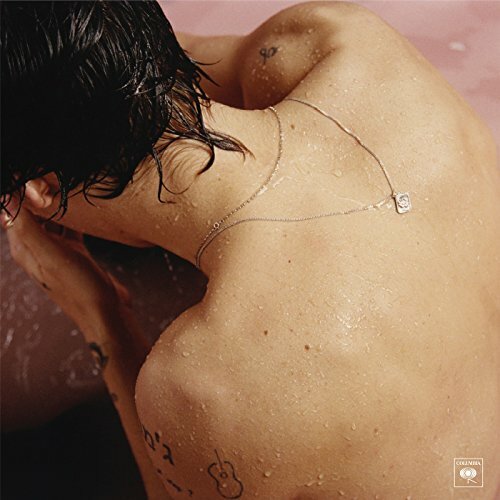 Heading into Harry Styles’ self-titled album was like heading into a movie remake. We already knew it would be great, it was just a matter of how he would make it great. The 10-song release is very obviously influenced by by rock classics. Fans of the genre will undoubtedly pick out nods to David Bowie, Mick Jagger, the Beatles and even a touch of Elton John. It’s a far cry from what we’re used to hearing from the singer, and it suits him well. Marrying his influences with his innate lyricism, it’s quite clear Styles is the star we always thought he’d be. It’s tough to pick a standout track, as they all bring something to the table and it’d be hard to imagine any of them not being a part of the track list, but if forced we would have to choose the closing track “From the Dining Table.” The track is an exploration of Styles’ emotive landscape in 3 minutes and 36 seconds. The barren song consisting of harmonies, a single guitar and a brief swelling of strings is a tale of yearning. “Even my phone misses your call, by the way,” he laments. It’s an honest and bare bones moment that only further proved Styles to be the genuine artist that he is. Here is the honest truth: It’s going to be the cool thing to hate on Harry Styles. There are going to be a large amount of people who already know in their mind, that they will not like the self-titled debut from the 23-year- old based solely on the fact that he had gotten his start in a boy band. There it is. The truth. There are people out there that are going to let themselves lose out on a great album for the sake of “being too cool” to like something that came from a pop star. If there’s anything that you take away from this review, it should be to not let yourself be one of those people. It isn’t very often members from bands as big as One Direction can break away from the shadow cast by the former success and manage to make a name for themselves, so it’d be a shame to deny yourself the opportunity to witness the beginning of something great.